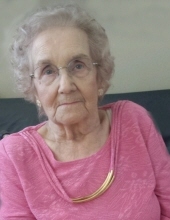 Stella Mae Kettenring, age 93, widow to Jakie Kettenring, Jr., passed away Sunday, November 25, 2018 in Georgetown, Kentucky. She was born May 23, 1925 in Hustonville, Kentucky to the late Bill and Elizabeth Qualls Hafley. Stella was a member of Great Crossing Baptist Church and attended Oxford Christian Church. Stella, along with her husband Jakie, operated Crossings Grocery for many years. In the following years, Stella worked as a dispatch for Jones Cab, and in her later years sat with elderly patients in nursing facilities and their homes. Stella is survived by her daughters, Louise (Plummer) Trammell of Lexington, Pam (Paul) Duncan of Georgetown, and Lisa (Donnie) Lemons of Georgetown, 7 grandchildren, Janci Murray, Jason Bridgeman, Michele Woods, Van Duncan, Stacie Wilson, Jake Jones, and Lucas Lemons, 8 great grandchildren, Macey Murray, Chase Bridgeman, Nathan Woods, Alora & Addison Wilson, Trystan Williamson, and Skylar & Alexander Jones, nieces and nephews, sister-in-law, Lena McGill and special friend Larry Drake. Stella was preceded in death by her brothers, Otis, William, and George Hafley, a daughter and son-in-law, Joyce and Clay Bridgeman, one grandson, Justin Williamson, and infant granddaughter. Stella loved being with family and friends, and enjoyed working outside in her flowers at her home. Stella's family would like to express special thanks to all of her caregivers over the last years at Dover and currently at Signature Nursing Home. Stella's visitation will be Tuesday, November 27, 2018 from 5:00-8:00pm at Tucker, Yocum, & Wilson Funeral Home. Her service will be Wednesday, November 28 at 10:00am at the funeral home with ministers Chris Cash and Glenn Redmon officiating. Burial will follow at Georgetown Cemetery with pallbearers being, Van Duncan, Matt Wilson, Jake Jones, Lucas Lemons, Billy Hafley, and Charlie Simpson. To send flowers or a remembrance gift to the family of Stella Mae Kettenring, please visit our Tribute Store. "Email Address" would like to share the life celebration of Stella Mae Kettenring. Click on the "link" to go to share a favorite memory or leave a condolence message for the family.